Quality commitment | FFPM – Fédération Française des Pilotes Maritimes. Established since 1996, the iso 9001 2008 certification was set up by ” Fédération Française des Pilotes Maritimes” (FFPM) (French Maritime Pilots Association), covering a multi-site approach. By adopting these norms, the station shows its willingness to reinforce its image by constantly improving its service to vessels and satisfying its clients, the shipowners. The FFPM is presently working on changing to the new ISO 9001-2015 certification , wich will enter in force in 2018. Comply with and apply the QMS documents of the station. 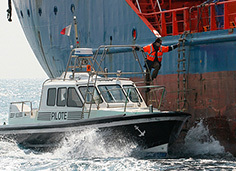 Attend vessels in the best possible safety conditions. Inform the captain of the details of the pilotage operation, let him know about their intentions before carrying out the operation and make sure that he understands. Report to the harbour master and other vessels all relevant information regarding the efficiency and safety of traffic flow. Be courteous in theirrelationship with captains, agents, and other relevant parties whilst carrying out their professional duties. Inform the ship’s agent of any problem that occurs during the pilotage operation. Immediately report to the harbour master and/or the relevant maritime authority any accidents, incidences, deficiencies, observations, likely to hold up navigation safety, the environment or the port installations. Promptly notify the “vessel safety centre any deficiency noted aboard vessels which could consist in a risk to human life at sea, to navigation safety or to the environment. Keep their technical and legal knowledge up to date in order to carry out pilotage in the correct manner. 3° The procedures of the quality management system (QMS). Process n°1 : Piloting the vessel (on the bridge). 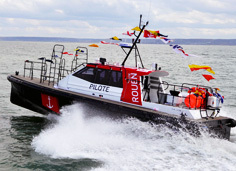 The pilot is designated according to the rota system and familiarises himself with the operation with the data included in the information sheet. Once on the bridge of the vessel he analyses the feasibility of the operation in agreement with the captain. He carries out the operation whilst ensuring the planned procedures take place. Back at the station, he reports on the conformance or non conformance of the operation on his information sheet, which he then puts in the relative pigeon hole with the pilotage slip. In the case of a non conformance needing to be dealt with immediately, the pilot will take all steps that he deems necessary in order to sort it out as soon as possible. Process n°2 : Ensuring the boarding and the disembarking of the pilote (vehicle, launch, helicopter). Vehicles, launch, helicopter and human ressources of the station are at the disposal of the designated pilot. Process n°3 : Dealing with the orders for a pilot and ensuring its follow up. Request of pilots for inbound vessels are organised by the “capitainerie” (le havre port) depending on the agents orders and berth availability. After confirming with the chief pilot the feasibility of the movement, designation of pilots who will ensure the flow of traffic within the port is arranged. Request of pilots for outbound or shifting vessels are addressed directly by the agent to the chief pilot who advises agents regarding all technical or tariff related questions concerning a vessel. Process n°4 : Provide, manage and maintain necessary equipment in order to run an efficient service. The purchase of equipment and choice of suppliers is determined depending on an evaluation of needs. Once the equipment is bought, it is necessary to plan its use and ensure its maintenance in order to have a total availability of material means at the pilot station. Process n°5 : Provide human ressources and manage skills. A competence profile is established for each duty : it sets the needs required for a certain job. The initial training forpilots and personnel is rigorously set up and ensured within the establishment. A yearly evaluation of training needs is done and then dealt with using an external training programme. These training courses are evaluated by the trainee as well as by the person in charge of the procedure. The pilots follow a training programme on a ship handling simulator taking into account their level of experience and the areas piloted. Simultaneously, the pilots take knowledge upkeep modules in order to perfect their ability to ensure a high quality service. Process n°6 : Manage the pilot station whilst ensuring a quality service and whilst permanently improving the system. Management is the heart of the QMS and makes particularly sure that the clients are satisfied with the service that they receive. Management must also report to its administration in compliance with the legal obligations relevant to the public service of pilotage. These commitments are included in the policy and the QMS objectives of the pilot station, which are taken from the commitments of the “FFPM” (French maritime pilots association). Attention is paid to clients’ remarks permanently through daily connections with captains and marine agents. Detailed inspection allows the management to follow up commitmentsregarding quality and to analyse the proper functioning of internal procedures of the station, and their constant improvement, by putting action plans in force. Process n°7: Managing the QMS defined by the french association, with the aim of permanent improvement. 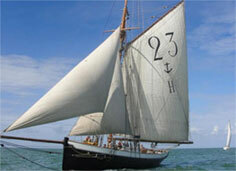 The association is the interlocutor of the administration for organising the french pilotage. The association defines the policy and the QMS objectives of the profession. It also needs feed-back from pilot stations in order to defend their interest at either local, national and international level. – The national management inspection held during the associationyearly meeting ensures the follow up of QMS commitment of the corporation by analysing audits and results of the stations, and the setting up of plans of action for the improvement of the QMS efficiency.